Bicycle tyres are not just a way of keeping the inner tube in place. In this particular area, cyclists value different properties. Manufacturers - Continental and Schwalbe are, no doubt, among the most well-known - offer an incredibly varied range of tyres. This is to ensure that - wherever you intend to cycle - you will have the right tyres. You might want rough studs or extra wide tyres, extremely strong grip, a certain behaviour when cycling around corners or a particularly lightweight tyre. Every cyclist sets their own priorities and also sets their own limits in terms of budget for a new set of tyres. Mountain bikes call for wider tyres than racing bikes. With fat bikes the perfect tyre will have a lot of material (and weight) and city bikes do not need state-of-the-art studs. As you can see, all tyres are not the same. Mounting the tyres on to your bicycle may take some practice. Many a cyclist has despaired over having to remove and re-attach the tyre. But you mustn't let that scare you off from learning how! It is just when you are out and about and you are then faced with having to fix a flat tyre that you will wish you had those skills. Carcass = The framework of the rubber, made up of strong fibres that have been vulcanised onto the rubber material. The properties of the carcass are determined by the number of layers of fabric as well as the thickness of the threads (measured in threads per inch or TPI). The more layers of fibre material a tyre has, the better it is protected against foreign bodies breaking through. On the flip side, this also means that the tyre is heavier and does not roll as well. The better the fabric, the better you are protected from punctures and the better your rolling friction. However, tyres like these also carry a higher price tag. Tread = Along with different rubber compounds, it is the tread of the tyre that gives you either more or less grip on different surfaces. This means that some tyres are better suited to hard surfaces whereas others are better suited to soft surfaces. There are also different treads for wet or dry weather conditions. Rubber compound = Whether it be in regards to the longevity of the material, grip or weight, all of these factors are determined by the rubber compound. With a rubber mixture you get a rather soft tyre, giving you better grip. However, your rolling friction will increase, meaning that the tyre will not roll as well. On the opposite end of the spectrum, we have hard rubber compounds. These rubber compounds roll better and last longer. However, due to the low grip that they offer, you will feel their limitations much sooner. Compound = Mixture of different rubbers A lot of manufacturers combine different rubber compounds to make the studs on the sides more effective and to ensure that the tyre rolls well. This also results in better longevity for the running surface. This is where terms such as dual compound or triple compound come into play. Clincher tyres = The bead contains a Kevlar fibre instead of a steel wire. This means that the tyre is ultimately more expensive, lighter and foldable, making it easy for you to easily carry a reserve tyre in your backpack. Clincher tyres are usually only offered with top-notch carcasses and rubber compounds. This means that they have excellent riding properties. The fact that they are foldable, however, does not affect their performance on the road or wherever you may be cycling. Wired-on tyre = This term may be used to refer to a bead containing a steel wire as opposed to a clincher tyre. In the case of racing bikes, this term tends to be used for clincher tyres with hook-bead rims. This is in contrast to tubular tyres for which adhesive bonding is used. Tubular tyres = These are tyres with an enclosed carcass that contains a sewn-in tube. Tubular tyres are stuck to beadless rims by means of liquid tyre glue or double-sided tape intended for this purpose. Tubeless and UST systems = Both are tyres that do not require a tube. Tubeless ready tyres must be sealed by a special sealant. UST systems do not require this sealant at all. On the flip side, these tyres are also a lot heavier. Your can read more about UST here. Please refer to the imprint on the tyre flanks for this. Generally speaking, however, the correct tyre pressure can be determined as follows: the bigger the tyre and the lighter the person riding the bike, the lower the pressure needed. Lower pressure makes cycling more comfortable. On rough surfaces, this also translates into lower rolling friction. Higher pressure comes with a lower risk of punctures. It also reduces rolling friction on plain surfaces. What tyres to use in the winter? There is no reason to stop cycling over the winter of course! Naturally, we have winter tyres for your bike in our product range. 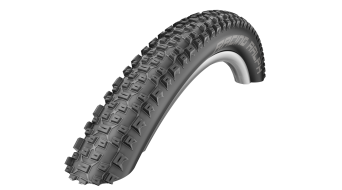 Be sure to use MTB tyres that give you enough tread and a lot of grip if you are heading out during the winter. This is, of course, unless you switch to a fat bike. Fat bikes come with wide tyres, which makes for a lot of fun in the snow. For the icy season, it is definitely worth getting spikes! MTB spike tyres are fun even on slippery surfaces. The spikes in the tyre surface make it easy to go uphill while maintaining grip. When heading downhill, you won't have to worry about flying off your bike. These tyres always maintain grip on packed snow or ice. Just be careful when getting off your bike. Your two-wheeled friend is the one with the grip! So you're the one who might slip. Be it a 26", 28" or 29" wheel. Whatever size you need, you can choose your favourite from a range of MTB tyres, racing tyres or trekking tyres. We are also your one-stop-shop for any accessories you might need, such as rim tapes or anything for your tubeless tyres. Our bicycle-tyre shop offers you both a wide range of products as well as fantastic offers.